Rampant TechPress is unique, targeting IT professionals who need fast and accurate working examples for complex technical issues. 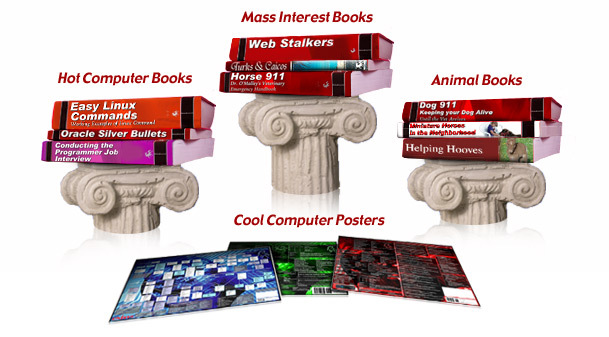 Rampant books have a super-tight focus and quickly provide IT professionals with what they need to solve their problems. Each book comes with an online code depot of working scripts to get you started, Fast! Best of all, Rampant Books are practical and affordable. By finding the world's most widely-read content experts, Rampant books is for working professionals, by working professionals. Rampant is not motivated by profit. Because we put quality first, Rampant can offer world-class technical books at a fraction of the cost of other high-profit publishers. Rampant Books are distributed worldwide through major retail channels including Amazon, Barnes & Noble, Borders and leading bookstores throughout Europe and Asia. Rampant Oracle books have experienced unprecedented growth and Rampant is now the world fastest-growing Oracle publisher with over 50 Oracle books and downloads. Expert Authors – All Rampant TechPress authors are content experts and are carefully screened for technical ability and communications skills. Code Depot – Rampant TechPress books are packed with working examples and pragmatic tips. When applicable, all code scripts from Rampant TechPress books are available on the web for instant download. Pragmatic – Practicing IT professionals know the concepts and they need working code to get started fast. Rampant does not publish theory books, and insists on practical content that allows our readers to quickly understand and apply the technology. Concise – Most Rampant TechPress books are less than 250 pages and get right to-the-point of the tough technical issues. Tight focus - The Rampant TechPress books addresses tight IT topics and targets specific technical areas of technology. Affordable – Reasonably priced, Rampant TechPress books are the perfect solution to challenging technical issues. Want to become an author? Please review our suggestions for choosing and Justifying your computer book proposal.